Excel Jetcell .NET is a professional, scalable & feature rich .NET component that allows developers to add the ability to create, generate, read and write Excel Spreadsheet files ( XLSX , XLS , CSV ) in ASP.NET applications or website projects (C#, VB.NET). The set of API functions allows developers to read, write Excel data up to Excel Cell value and its styles, fonts, colors, borders etc. Also Excel Jetcell .NET has functions to get access to range of cells or whole Worksheet. The component can read, write data from Excel to DataTable and much more - all this without the need to use Microsoft Excel or Microsoft Office Automation. Font formatting (size, color, font type, italic and strikeout properties, boldness, underlining, subscript and superscript). Excel spreadsheet Row height and Column width. Cell styles (rotation, indentation, text wrapping). Cell Background and Fill Pattern. Merged Cells in Excel spreadsheet. Rich Text for excel cells. PASSWORD protection of Excel file. Hiding / Showing an excel worksheet. The ability to hide and unhide Row/Column. Excel files XSLX, XLS, CSV. Excel Jetcell .NET is designed and developed to provide with convenient object model and easy to use API. Caching also enables you to access Excel cells in a more natural way. 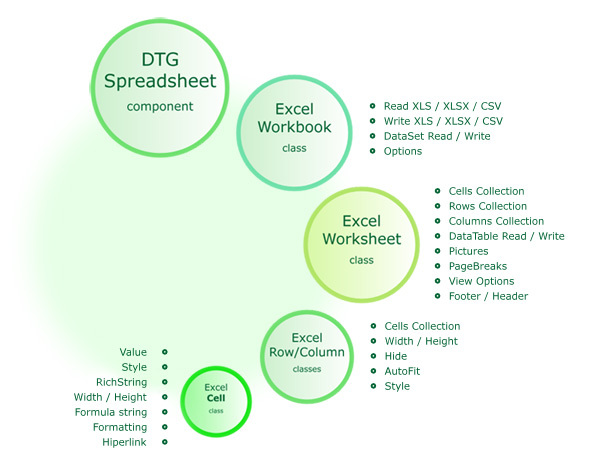 The plain code will help a developer to manage any complex Excel spreadsheet. Cells("A1").Value = "Excel writer example (C#)"
Cells("B1").Value = "=550 + 5"
Excel Jetcell .NET component requires only .NET Framework and is many times faster than Excel automation objects. The code of Excel Jetcell .NET component is fully managed and works under .NET Framework started from 2.0 version. Developers can create C# / VB.NET applications or deploy website on servers with medium-trust level without needing to rely on Microsoft Excel. Generate / Create Excel files. Export database to Excel file. Generate table data as Excel file. The Html To Excel .NET is an extension of the Excel Jetcell .NET component. 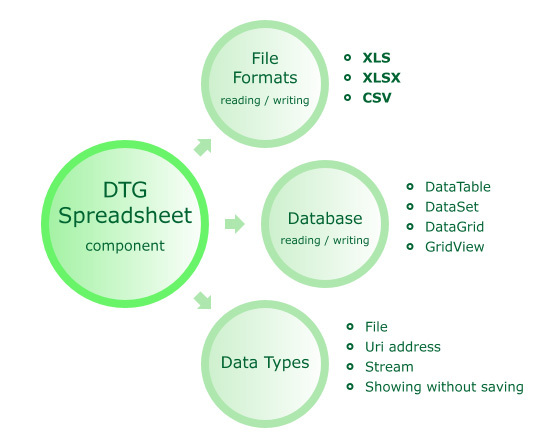 This componet contains all features needed to export Html to Excel.